Zillay A. Nawab is a Certified Organizational Excellence Specialist with OES and on the research team participating on the ‘first global assessment on the current state of organizational excellence’ that was launched by the OETC and has been supported by the GBN, ISO/TC 176 and International Academy for Quality. He is a management consulting professional with extensive experience in multiple business segments, both in the Public and Private sectors. Zillay is an expert in implementing organizational excellence and managing complex transformation programs, with an effective blend of leadership, facilitation and collaboration. Actively involved in development of international standards, he chairs Canadian and International ISO committees and is a contributing author of ISO guidelines on the Sharing Economy. 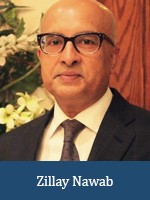 Zillay is a registered professional engineer, President and Founder of Hashtag Consulting Solutions Inc. and Director at the Pakistan Management Excellence Award Secretariat.